Engineered Wood Flooring is made up of multiple layers of solid wood in a cross-ply construction. Engineered wood is real wood, but instead of one solid piece of wood, it is made up of three to ten thick layers of wood, called piles, that are assembled and glued in a cross-ply construction. Engineered wood floors are still considered “hardwood,” but they are built in layers of hardwood. The top layer of wood can range from 1/16" to 1/6" thick. Overall board thickness ranges from 1/4" to 3/4". Due to the multi-ply structure, engineered wood is more stable than solid wood and is less susceptible to shrinking and expanding with changes in temperatures and humidity. Engineered hardwood flooring can be installed directly over concrete and can also be installed below ground level. Also, engineered wood flooring is Green. 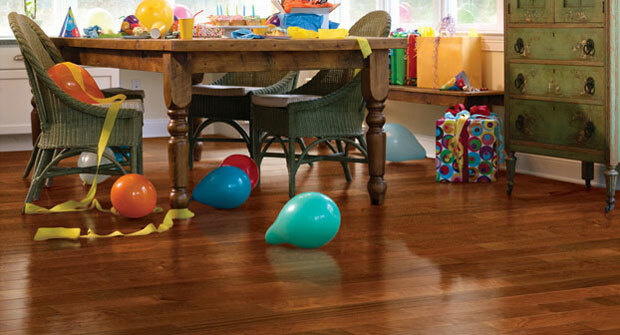 Purchasing engineered wood flooring helps conserve expensive prized wood. For every 1 sq foot of 3/4 inch thick solid wood flooring manufactured you can manufacturer approx 4 times that amount into engineered wood flooring.